LAHORE: Lahore University of Management Sciences (LUMS) on Wednesday joined hands with Punjab Group of Colleges (PGC) through a memorandum of understanding (MoU) to facilitate research and outreach efforts working towards the common goal of building a robust education ecosystem in Pakistan. The event started with a welcome note by LUMS Vice Chancellor Prof Dr S Sohail H Naqvi and an introduction of the LUMS School of Education by its Associate Dean Dr Mariam Chughtai. While addressing the audience at the occasion, Prof Dr S Sohail H Naqvi stated, “The collaboration between the Punjab Group of Colleges and the LUMS School of Education (SOE) would serve an important role in reforming the education sector in Pakistan. The executive director of the PGC, Prof Sohail Afzal also emphasised the significance of the MoU. “There is a need for the continuous professional development of teaching faculty, and our teachers need to be trained to develop the knowledge and skills to address students’ learning challenges,” he said. LUMS SOE Associate Dean Dr Mariam Chughtai said, “Education is the driver of economic growth and the fastest growing sector in Pakistan. We must look at this as an opportunity between the two institutions to impact policy reform”. 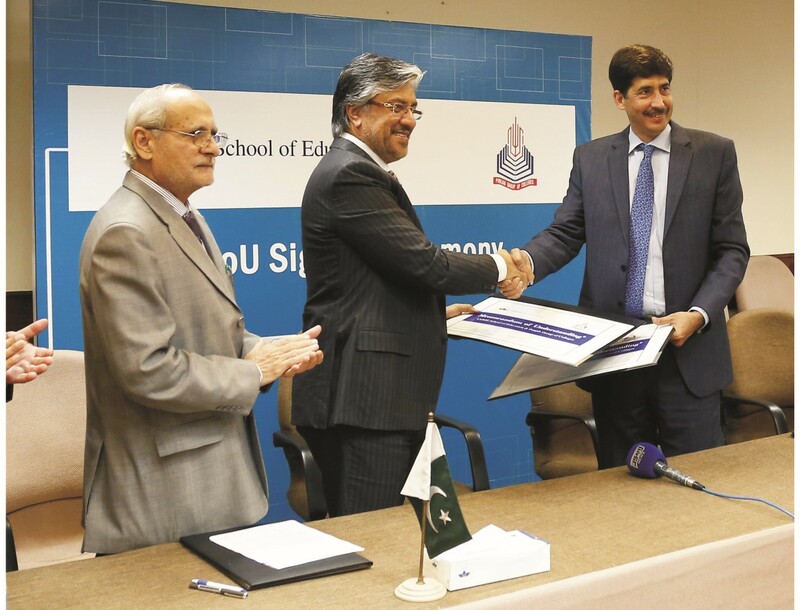 Allied Schools project director said that the scope of work for both the PGC and LUMS SOE was gigantic and weighty to meet with instant and future needs in the field of education across Pakistan where literacy rate, teachers’ professional development and institutional effectiveness were under question. This collaboration between the LUMS SOE and the PGC/Allied Schools would engage in high-quality education research that would help bridge the gap between theory and practice in the education sector, he said. The collaboration would enable graduate students to use the data shared by the PGC and Allied Schools for research purposes, and would also be given the option of a full-time residency at the PGC over the course of one semester.